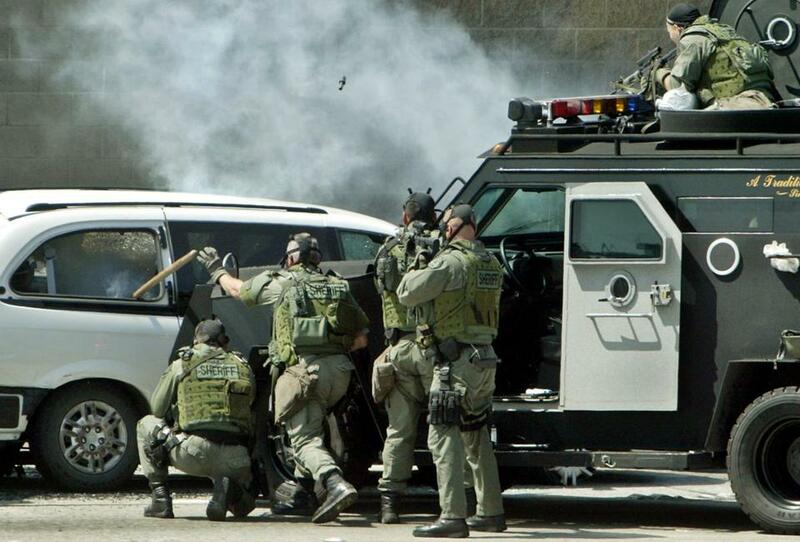 Los Angeles Sheriffs deputies broke the windows of a van after firing a "flash-point" grenade into the vehicle in Alhambra, Calif., during a suspected kidnapping in 2005. Police in Massachusetts may have to give up some of their military equipment, items including grenade launchers and bayonet knives, which have been obtained through a federal government program that President Barack Obama is looking to scale back. The program, which sends surplus US Department of Defense equipment to federal and state law enforcement agencies, faced scrutiny last year after police in Ferguson, Mo., used the military-grade equipment during the riots. Local agencies receive the equipment free through the program; they only pay shipping costs. On Monday, President Obama announced the federal 1033 government will no longer provide or fund some types of military equipment, including weaponized aircraft or vehicles and camouflage uniforms for local police agencies. The federal government is looking into recalling prohibited equipment already distributed, according to the Associated Press. The Massachusetts State Police, which facilitates the 1033 program in this state, has not yet received a directive from the federal government about how to handle these new regulations, said David Procopio, the State Police spokesman. Records show Massachusetts police departments have increased their participation in the program in recent years. For the most part, the equipment transferred to Massachusetts law enforcement agencies — mostly small caliber weapons and utility vehicles — is already in compliance with Obama’s new order, Procopio said. Find out which items your local police department has obtained through the 1033 program. But some agencies’ stockpiles may include items on the list of proposed restriction, including the West Springfield Police Department, which owns two grenade launchers, and the Clinton Police Department, which has 27 bayonet knives. 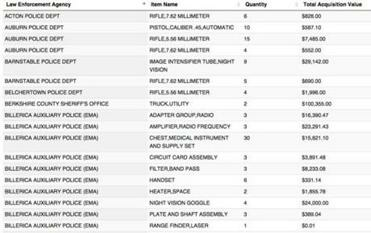 A reported 110 municipal police departments, three campus police departments, and 11 other Massachusetts-based agencies have received about $12.2 million in surplus military equipment, including more than 600 5.56mm rifles and more than 300 7.62mm rifles, according to 1033 program data, which is updated quarterly. Neither type of firearm has a caliber of .50 or more, which would qualify them for the ban. Some of the state’s smallest communities have received the largest monetary values in equipment, the data show. The Leyden Police Department, which patrols a town of fewer than 700 residents, received 119 pieces of military equipment including trucks, generators, and cold weather boots. The total value of the acquisitions was about $445,000. The Massachusetts State Police received the highest total value at about $2.1 million in program-related equipment, all of which is in compliance with the new regulations, said Procopio. To get firearms, equipment, or vehicles through this program, law enforcement agencies fill out a form and submit it to the Massachusetts State Police. In Massachusetts, they are required to have the approval of a town manager, mayor, or board of selectman, said Procopio. Obama’s proposal Monday would require all law enforcement agencies applying for some equipment, including Humvees, drones, or specialized firearms, to obtain such approval and provide a persuasive explanation of why it is needed. Agencies would also be required to conduct training with the equipment and collect data about its use.